The popular coonskin cap headgear worn by Parker in the movie became the most popular item among the Davy Crockett products which pulled in $100 million. The caps were most popular with young boys but many adults,chief amongst them Presidential candidate Senator Estes Kefauver, joined in on the craze, wearing them at numerous public appearances. 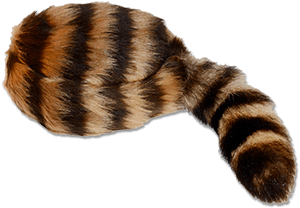 After a shortage in raccoon tails caused people to turn to using muskrat, rabbit, and fox tails, the fad died out by December of 1955.